I know. I know. I can tell I am just about to lose you. . .
And, yet. . . I just can't get past how fresh and cool Carlos Mota's bedroom looks in his house in the Dominican Republic. 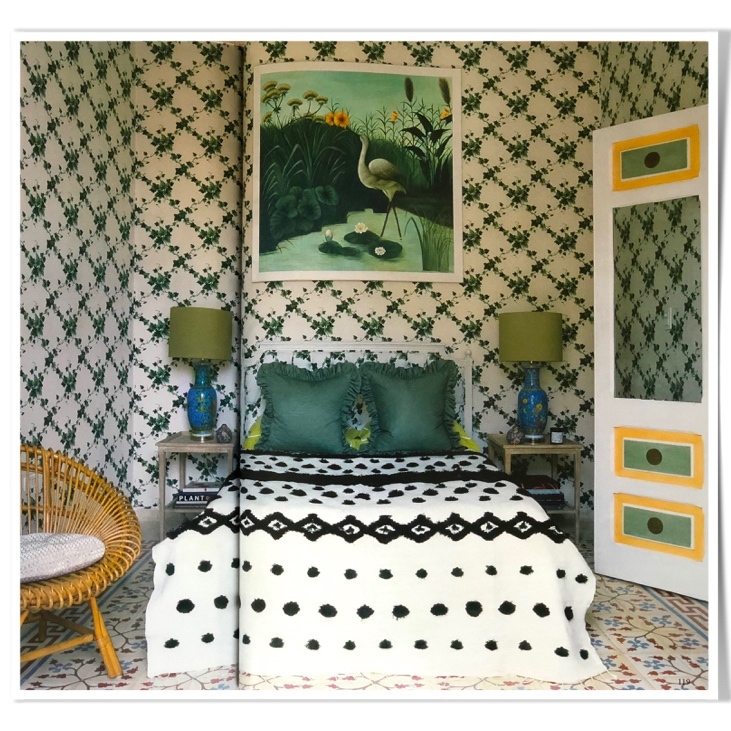 The complete (and truly amazing) house is featured in this month's World of Interiors, which I have come to regard as the bellwether in the industry - along with Cabana. Their vibe is totally old school brought new in a way that challenges me and pushes me outside of my comfort zone, but in a good way. And, like the fashion runways, the new ideas can be hard to digest at first - especially in their purest form. But, they stick with you. And, after a minute, you begin to realize the genius behind it and you really begin to feel the energy and get inspired. Anyway, I mean F-R-E-S-H. Carlos' room, that is. (Follow Carlos @casamoto on Insta). I love the wallcovering!!!! Like, absolutely love!!! It's a fabric by Jean-Paul Beaujard. 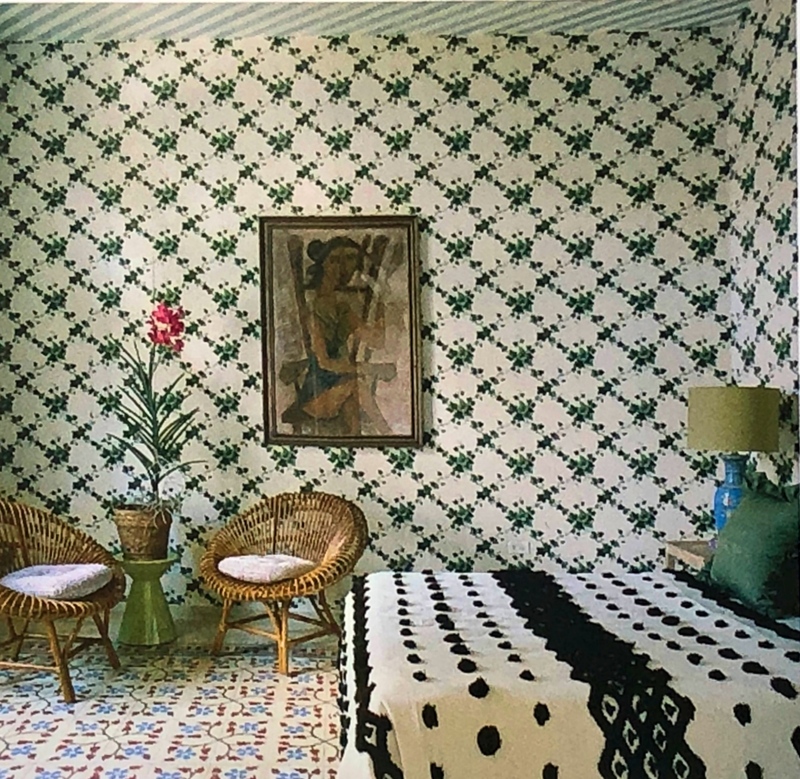 I particularly love how graphic the trellis is and I am totally jammin' on the schism between the wallcovering and the also-very-graphic black and white bedspread (it's probably been 20 years since I have used the word "bedspread"). I love how the blue lamps pop. I love how gorgeous the warm tan rattan looks against the bottle green and white trellis. I really just love it all. And, all of the sudden, I kind of feel like I want to see more of this - this being ivy fabric/wallcovering. If I had a client who was game, I could totally do a riff on this and I bet it would be fab! I'm thinking maybe with some rattan, a Beni Ourain rug, a saturated Spitzmiller lamp and a Penny Morrison silk sari shade????? And, also, FYI, the kids are using the shorthand "WTM" whilst texting to denote "What's the move" as in "Where are we going next?" You are welcome. #keepingupwiththemillennials.